So, you are thinking about launching a podcast as the key strategic element of your content marketing, lead generation and business growth? Great – you are feeling excited by the possibilities! What about your podcast category? Your podcast niche? So off you go and pop over to Apple Podcasts (iTunes) and check out the categories that are relevant for your embryonic podcast idea…and see loads and loads of podcasts in your niche already. Your heart sinks. You feel like giving up already. There are too many podcasts in your category… apparently! 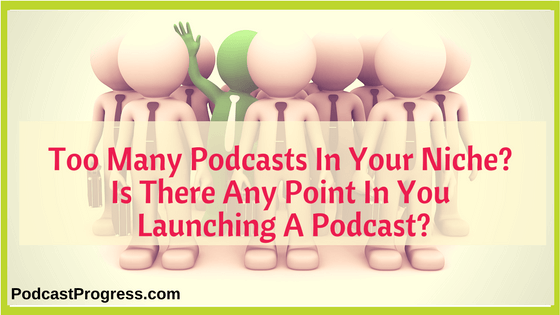 The key is looking at what your niche REALLY is, and getting very clear and detailed about the basic strategy items of developing a podcast. What unique aspect of your niche would work well as a podcast? What value and support do you intend to provide to your audience? Who are your audience? What do you have to say about a unique aspect of your niche? Get the idea? You need to really drill down into your niche, your audience and your uniqueness to develop a strategic podcast. A podcast that can be a success for you – as defined by you. This is not a quick 10 minute chat with your best buddies before you rush off and order a shiny new microphone and gadgets you THINK you might need. When you spend time on the strategic aspects of your potential niche and truly dig in and explore your niche then it is likely that you will be able to come up with a unique podcast concept. Yes, despite initial impressions to the contrary, despite seeing all those competing podcasts in ‘your’ podcast category. were the first two, and the latest, so it looks like there is some serial podcasting binge listening going on. People discover the latest and then they are going back to the start to listen to all the episodes. An interesting idea I will keep an eye on in the rankings and stats. So, as I trawl through the listings, looking for where Stitchery Stories and my episodes are ranked… what do I notice? It seems like “all the podcasts in Visual Arts are about Photography”! And I spot new ones too. Why on earth would anyone think about launching YET ANOTHER podcast about Photography? I thought about it and then went and checked out each photography podcast in the Visual Arts category. There were 66 out of the top 200 podcasts. Yes, exactly ONE THIRD are based on Photography! Really? WOW! Firstly, that tells me that actually, photography is an incredibly popular subject with podcast listeners. All those podcasts are getting enough listeners to get ranked regularly in the Top200 Visual Arts. Not just ranked – let’s face it, at one third coverage, photography is DOMINATING that category. Photography is also an incredibly popular hobby, and a great employment option too. We live in a very visual age on social media and there is an endless appetite for quality images. Also, for visual storytelling. As I checked out each photography related podcast in the category, there emerged a wide range of photography sub-niches. also podcasts about improving your technical ability as a photographer. Understanding the equipment, and subjects such as light, composition, filters and so forth. Oh and of course manipulating the images afterwards. consideration of their niche, or a determination to do something different and better, then there surely is still an opportunity for launching ‘yet another podcast on photography within the Visual Arts category. easy to give up too early. And miss a fantastic opportunity. That’s why a conversation with someone like me is a great idea. I focus on guiding you through ALL the elements of creating a fantastic podcast that supports your business goals. There truly is much more to podcast strategy than picking a title, getting some artwork done, buying a microphone and hitting record. I am launching a specific ‘Podcast Possibilities’ package which will focus on these ideas. At the end of my process, you will be very clear about podcasting for your business. You will know if podcasting is indeed the perfect platform for YOU and your business. It is not for everyone. Better to know now, than after wasting many hours, tons of effort and a pile of money on something that you should never have started. Drop me an email info@podcastprogress.com and let’s have a chat and get started. How Easy Is It To Create A Podcast?